My second atempt on the new track. On my summum. Me testing out my new favorite track. My legs did not hold out as good as last time. But i did have some better lines here and there, but still some work needs to be done. nice riding dude, how's the Summum compared to the Legend ??? Just love the place. Super nice nature and pretty dry. But in the wet i think that place is pretty gnarly. It is much steeper than it looks. My chainguide touched the rocks on several locations. A specially where i laugh. Hehe. But i still cant seem to get a good speed at the rock at the top after i pass that lady coming upwards. Its to sudden and steep. Momentum is all fubar. Might just have to do a repetetive session just on that location, to perfect it. The rock is over a meter high. So on camera it looks flat. 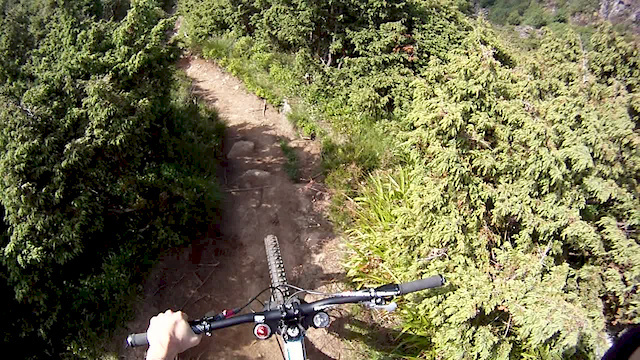 Only downside with helmet cams, everything looks flat. i know.. i looked at my footage of the mega last year.. and it looks like an XC route..
do mind.. if you keep trying to break your own record.. otherthings can break aswell ..
keep it in one piece dude..